Sagittarius is beautiful right now in Utah Valley where I live. It can only be seen from July- September, though, so you need to hurry to see it. 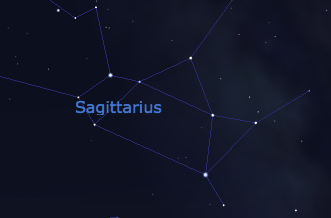 The constellation Sagittarius is just to the left of my favorite constellation, Scorpius. 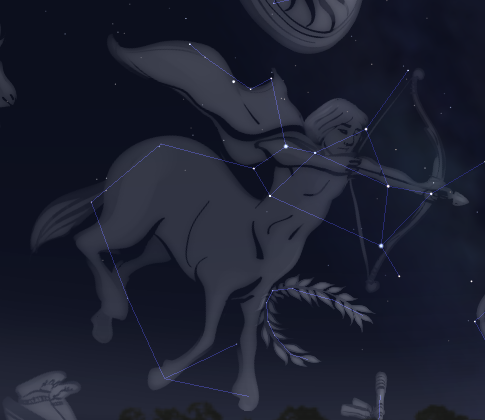 Both rise in the southern sky during summer and it looks like the Scorpion is dragging Sagittarius along behind it. There are several explanations for the constellation, the best of which is that it represents Chiron, the centaur tutor to the mortal Jason. Some say that Chiron placed himself placed this image in the Heavens to guide Jason to the Golden Fleece. 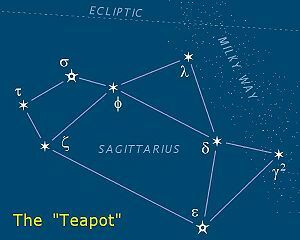 Sagittarius is supposed to be a centaur firing a bow, but many people call it a teapot. If you look for the teapot, it is pretty easy to find. Scorpio will help, but you can find Sagittarius directly south at about 10pm all through August (at least here in Utah). It looks very much like a teapot. 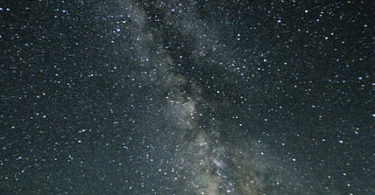 Sagittarius is gorgeous with the naked eye, but it is a huge thrill to deep-sky viewers. Most constellations have an interesting object or two, but Sagittarius is chock full of nebulae, clusters, and galaxies. In fact, there are a whopping 15 Messier objects in Sagittarius! If you have a telescope and a clear view of the southern sky, panning through Sagittarius is amazing as it is in one of the densest areas of the Milky Way.